Mini Jenny Doll in Topaz Vaseline, Bargain Shack offers Boyd Glass, Mosser Glass, L.G. Wright, and Contemporary Collectible Glass including Vaseline Glass - J.B. Scottie Dogs, Pooche, Animal Covered Nests, Toothpick Holders, Salts, Glass Animal Figurines, Clowns, Dolls, Slippers, Vehicles, and More! Meet the Miniature Jenny Doll in Topaz. 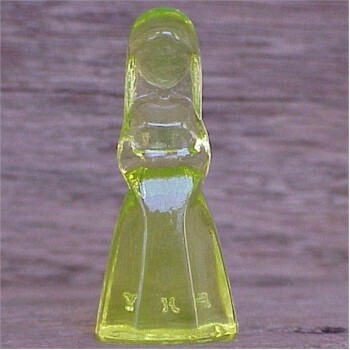 Topaz is actually vaseline glass and this Mini Jenny glows like a firefly under a black light. She stands a sweet petite 2-1/8" tall. Vi Hunter had the Mini Jenny created in only 23 different colors.